Ramsgate RNLI has been launched twice this afternoon (July 28) to people in difficulty. 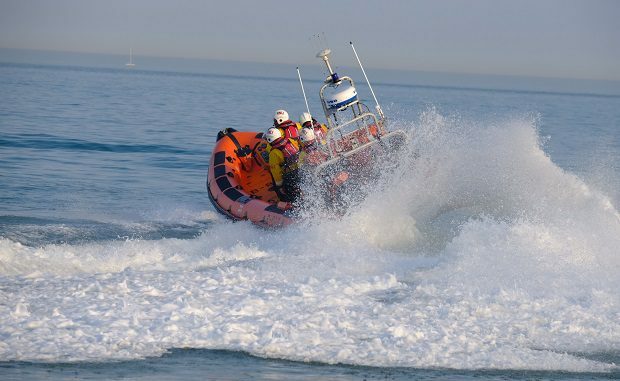 At around 4.20pm today the inshore lifeboat was sent to the aid of four people in an inflatable swept out to sea off Joss bay. Lifeguards attempted to help but couldn’t bring the people back inshore. The ILB launched to assist, taking the lifeguards back to shore and the four people from the inflatable to Ramsgate RNLI station. The ILB crew has now been called out to a report of a person in a canoe in difficulty off Stone Bay. UPDATE: A man fell out of his canoe and was helped ashore by a friend in a second canoe. One craft was left drifting which was retrieved by the RNLI crew. There is a 22 mph North-Easterly breeze with strong gusts pushing any non-powered craft offshore. People need to think before going out in blow-ups, and also not to swim too far out as currents along with the winds will quickly take you away. The weather has been hot for the past 6 weeks but last night the thunder-storm brought these winds so enjoy the beach but be very careful of the water. The safest place to swim is in the pool at Walpole Bay, but there are no lifeguards stationed there any longer. It is just important to be very watchful. Last week I was swimming across Westbrook Bay and I came across 2 boys in an inflatable little dinghy, quite a long way out. The problem was one of them had fallen into the water and couldn’t get back in the boat. He was hanging on ok but they couldn’t make any progress back in. I helped him back in and checked as they made their way back in. They were ver grateful So I would just emphasise, especially with inflatables and children, be extra vigilant and cautious. The wind was just too strong, went on rowing for over an hour but still only went further out. Big thanks to Joss Bay lifeguards, James & Neil for getting to us so quickly. And Big Thanks to the RNLI crew for taking us four to Ramsgate RNLI. Lesson learnt!